Brandon Flowers is to play a one-off show at the Eden Sessions this summer. The Killers frontman and now solo star will be joined by special guests Mystery Jets on July 12 at the Eden Project in Cornwall. Tjarko Wieringa, Eden Sessions Creative Director, said: "Brandon is one of the most recognisable and exciting artists around the moment and we're really excited that he'll be coming to Eden this summer. "Flamingo was one of the best albums of last year and Brandon has proved both with The Killers and during his solo shows that he is one of the best live performers there is." Primal Scream and The Horrors will take to the stage on June 23, followed by The Flaming Lips, The Go! Team and OK Go on June 30, and Fleet Foxes and Villagers on July 1, with further acts to be announced shortly. 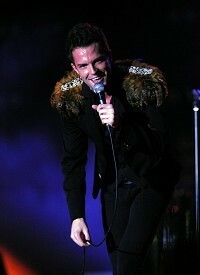 Tickets for the Brandon Flowers gig will be available from March 14 at the Eden box office. Veteran U2 rocker Bono is among the nominees for the inaugural Mikhail Gorbachev: the man who changed the world awards. Bob Dylan is to headline a new summer festival which revives the spirit of the long-running Fleadh shows. Even without his nimble fingers touching their strings, Eric Clapton's guitars rocked New York City as an auction of them brought in millions of dollars. Phil Collins has told how he decided to knock his music career on the head for the sake of his children. 50 Cent is the latest artist to make a donation to charity after it was revealed he performed at an event linked to the clan of Libyan leader Moammar Gaddafi.